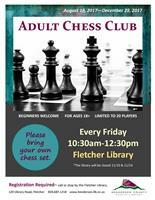 Chess Club for adults 18+ will meet at the Fletcher Library every Friday, 10:30 – 12:30. Beginners are welcome- please bring your own chess set. Limited to 20 players.